featured below topped the charts in the categories we considered. Choose the best of the best and take a look at these excellent products before looking anywhere else. Finding the right tennis overgrip is important due to the enhancements that they provide for the player. The right overgrip will add some stickiness to the handle and will absorb sweat as well. This reduces the chances of the tennis racquet slipping out of your hands even when you’re sweating. The clothlike tape that wraps around the grip of the handle is called the overgrip. It is aptly named since it does go over the existing grip of the racquet. Some other benefits that the player can realize when using an overgrip include a larger circumference of the tennis racquet and feeling more padding and cushioning during play. There are many different types of overgrips on the market. They have different patterns and colors as well. This adds some personality to your racquet. 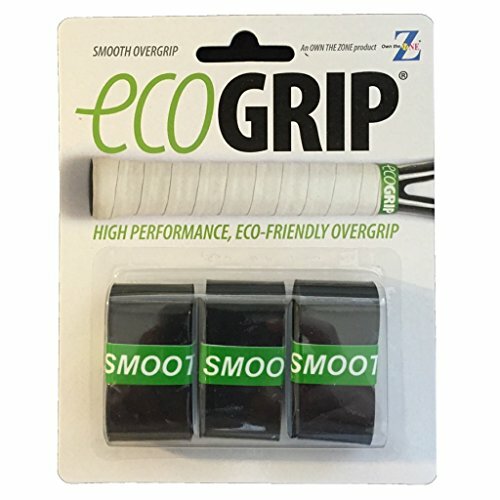 Overgrips are not just for tennis racquets; they can be used for squash, tennis, table tennis, badminton, and other racquet sports to improve grip and handling. Head Xtreme soft overgrips provide players with good sweat absorption and better gripping performance. They are made from elastomer and have extra large perforations in the material. They are made to be very thin and very tacky so you have maximum feel. 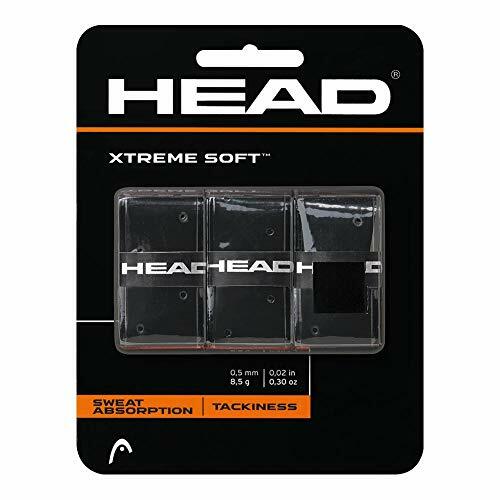 Head Xtreme is one of the thinnest available. If you’re looking for the overgrip that will not add bulk to the handle, this is the one for you. The super soft feel and good absorbency make playing a lot more enjoyable even when it is hot outside and your hands are sweating. There are three overgrips in this package. You can choose from black, white, fluorescent yellow, blue, and red. This convenient 10 pack of overgrips is designed to help improve the handling of your tennis racquet, bat, and any other handle type sport. These overgrips are made in the USA. Included in the package is finishing tape and 10 separately wrapped grips. 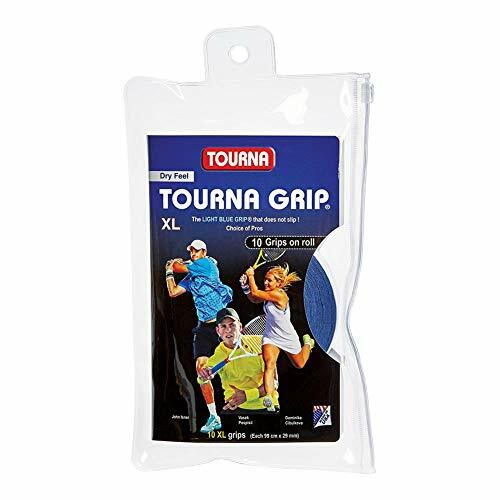 Many of the top 100 touring pro players use Tourna overgrip, which is the original overgrip product. The light blue overgrip provides extra dry grip and is super soft. Its exceptional performance really shines when it is wet. The light blue color that Tourna overgrip comes in is a registered trademark color so you know you have the right product if you see that trademark blue. The absorbency and soft texture of the overgrip has been called the ultimate in comfort by many professional and advanced players. The extra long tape is perfect for those with a two handed backhand or if you are wrapping a longer racquet handle. When looking for an overgrip for your tennis racquet, you want to find the best one possible that will provide the performance you’re looking for. That is exactly what you’ll get when you purchase the OTZ Eco Tennis Pro. It is the only biodegradable overgrip for sports that consumers can buy. Most of the overgrips on the market are made from polyurethane which is also what is used to manufacture many other products such as skateboard wheels and even heart valves. This material is not biodegradable and can take as long as 30-50 years to decompose if it does at all. Ecogrip has a patent pending and will decompose in a year, making it safe for the environment too. There are many famous tennis players that use Ecogrip and love the performance it provides. They prefer using it because of that eco friendly, biodegradable ability. OTZ is not just for tennis racquets; you can use it on m any other items as well including garden tools, lacrosse sticks, softball bats, hockey sticks and baseball bats. It has a superior feel, is very durable and features exceptional sweat absorption along with a no slip grip. This package provides 12 overgrips along with the finishing tape you need. All it’ll take is one time of using it and you’ll never want anything else. Finding the right overgrip in a sea of choices can feel very overwhelming. If you know what to look for and how to sort through the different kinds of the market, you will have a much easier time finding exactly what you need. The three top rated overgrips featured above are the best of the best and will provide the performance, grip and comfort level that you are looking for. If it is important to you to find environmentally conscious, the OTZ Ecogrip is perfect for you. It provides comfort, performance, dryness with eco friendly biodegradable properties that no other grip has. If you prefer a super tacky, thin feel go for the Head Xtreme and if you are looking for a product that has been around since the beginning of overgrips, then Tourna is what you want. Whichever one you choose, you can be reassured that the products will provide the grip and comfort you are looking for. Read the buyer’s guide below to learn more about overgrips and how to choose the right one for you. With the information provided in this buyer’s guide you will know exactly how to choose the overgrip that will meet your specific needs and preferences. Some of what it involved in finding the right overgrip will be personal preference. You may even try several types before deciding on the one you like the best. One of the first things you need to determine is if you prefer the feeling of a dry overgrip or a tacky one. Some players like the stickiness of the tacky grip and others will want the grip as dry as possible. If you already know which type you prefer, then you will be able to narrow the field of choices down somewhat. If not, we will help you gather the information you need to make a good selection. In this guide we will give you the tools you need to determine the best overgrip for your needs as well as your preferences. Overgrips provide players three important features that affect their performance: tack, cushioning or comfort and absorption. Depending on what you prefer, you may be focused on one feature over the others or you may concentrate on combining the different features to get the best overgrip you can. Tack – This is the term used for describing the stickiness of the overgrip. If the overgrip is very tacky, it “sticks” to the player’s hand which provides a very tight grip for them. If this is one of your preferences, you want to look for overgrips that promote long lasting tackiness since the product can lose tack with extended play. If this is not a feeling you like, you will want to look for an overgrip that offers more of a dry feeling rather than the stickiness of a very tacky one. Absorbency – Playing with sweaty hands is a given in most racquet sports. The temperature outside as well as how much your hands sweat will be factors in how much moisture you’re dealing with. Sweaty hands can mean a slippery hand if you are not mindful of finding a product that deals with this issue. You want to find a grip that is super absorbent so it takes the moisture away from your hand. Perforations on the overgrip work well to keep your hands dry and cool during play. Another benefit to super absorbent overgrips is the spongy, soft feel it provides which is very comfortable for the player and enhances the performance during play. Cushioning – The cushion that some overgrips provide can lessen the vibrations that come from hitting the ball with the racquet. If you want to lessen this vibration as much as possible, will use an overgrip with cushioning. This can make a difference in the amount of shock vibrations that the player encounters during play. Depending on the product, there are some that will offer more cushioning than others. One thing to watch out for is too much sponginess which can cause too much roundness in the handle. This can lessen the secure feel of the edges and some players don’t like that feeling. Wrapping your racquet properly is very important for many reasons. An improperly wrapped handle can be uncomfortable to hold. The overgrip can slip, unravel or bunch and cause comfort and performance problems for the player. It is not difficult to wrap an overgrip if you follow the simple instructions we have provided below. It gets easier each time you do it, so even if you struggle a little the first time, it will get much simpler the more you do it. If your racquet currently has an overgrip on it, you will need to remove that before you continue. You can also take this time to inspect your racquet handle and make sure that the replacement grip does not need to be replaced as well. Don’t forget this important inspection. When using an overgrip, it’s easy to forget the replacement grip underneath which can have compression problems with prolonged use. You can keep track of the replacement grip by measuring the circumference in the beginning and then periodically re-measuring it. If the replacement grip measures smaller after a period of time, replace it before continuing with the overgrip. Remove the overgrip from the package and take off the long strip covering the adhesive side of the tape. Hold the racquet with the handle pointing upward. You can either do this on your own or if you have assistance they can hold the racquet for you with the handle up. Place the tapered end of the tape at the bottom of the handle. Place it as close to the end cap as you can and hold it down with your thumb to get ready for the first wrap. Keep the overgrip tight while wrapping and wrap slowly so you don’t get wrinkles in wrap. Wrap up the handle, overlapping the overgrip by ¼” or so. You want the overgrip to be thicker at the bottom than it is at the top. Once the overgrip is applied, use the sticky tape that came with the overgrip and secure the handle. If you have a rubber tape cover, use that to cover the area and you are done. Purchasing a good quality overgrip is the easiest way there is to add size to your racquet if needed. They are also what you need to improve handling performance and to reduce the vibrational shocks you feel when the racquet makes contact with the ball. With all of the different overgrips on the market, you may be confused as to which one is the best. It will make the process easier if you know what your own playing preferences are in terms of tack and whether sweaty palms are a problem for you that you want an extra absorbent overgrip to help with. Once you have decided on the personal preferences you have, finding the right product that will meet those preferences is a matter of research and checking customer reviews to see how the product is performing in real world situations. Once you have found an overgrip you like, you can stock up so you have plenty of it when you need it. If it takes trying a few different products before you find your favorite that is okay as well. Different players will prefer different types of cushion, tack and dryness. Our top rated overgrips are the perfect place to start.